You might remember that the mighty Genie in the movie Alladin lived in a teeny little space. This phrase seemed to fit the subject today. Mini Books. Have you noticed that people will pick these up and look at them more readily than they will pick up your larger photo album? I have also found it fun to have a small album of a specific event or trip even though I might have it recorded in a larger album too. Some folks just whip out a mini book in no time. Others struggle with making one. Thought I'd share a couple of ideas we used in a book and maybe they will be of use for your next book! This is the Maya Road album that is approximately 4 x 4 inches overall, the pages are about 3 x 3 in size. I think that a tendency in these smaller books is to only use small prints. There is certainly nothing wrong in that, but thought this might give you a variation. Here we have used the 4 x 6 and 3.5 x 5 inch size prints for the book. As you can see in the photo above. the entire page is covered with a print. This focuses on the subject, who happens to be large and center in the photo. Since not all of your photos have the subject so perfectly placed, there are a couple of other ideas within the book. The photo on the right sided page has been torn to give some interest to the page. The tearing worked well for the beach shot-fitting in with the waves and sandy look of the original photo. We could also add a stamp which could have been journaling just as easily. Again, in this view, one page is the full photo. The other page (left side) is just paper. A stamp was used for the quote and the sea shells, picking up on the mood of the day and the photo used on the right sided page. On this last example, neither of the photos are kept in their full size. Cropping the photos with your scissors allows you to get the larger photos in the book while keeping the focus of the picture. These two pages just give other examples of using the paper with the photos for interest. Hope this sparked a new thought for you. Would love to see some of the books you do. If you are interested in more on this book, it is at the store on display. Thanks. As you know--if you receive our newsletter, the birthday crop sign ups were today. YES, it is full and we are doing a waiting list...you never know, so sign up for that if you are wanting to come that day. Two new lines from Sassafrass Lass-Apple Jack and Cherry Delicious. I don't have pictures of it, but you can take a look at their site here. The real wood has also arrived. So fun and so many possibilities. Think of the projects you could do mixing wood in with the paper, metal, canvas and other textures in the store. A box full of great die cuts from Scrap FX arrived as well. Some of the newest ones include packs for recipe books. We also got a new recipe book and baby book from them that you will love. 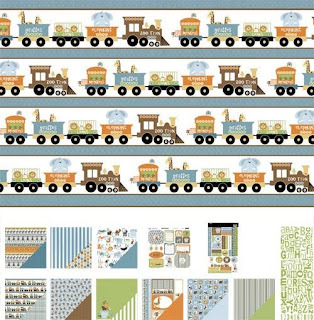 For anyone waiting for the restock of Domestic Goddess by Graphic 45--it is here too. 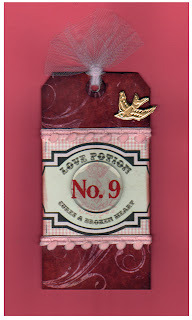 All of Wendy Vecchi's new stamps have arrived. I know a lot of you were waiting for those as well. Tomorrow is sure to bring even more yummy goodies... Later! Two winners have been chosen from the pictures submitted for the tags of Valentine's. I hope Carolyn will let me sleep here til 2010 ends. Thanks for all who have played along with us. If you did any of the tags, please send us pictures. Remember, the tags did not have to be exactly like ours, but just done with ours as a starting point. There are a couple of ways to submit photos. You can email them to us carolyn at thecraftyscrapper.com (change the at to @ of course). You can upload them to our facebook fan page. You can put them on your blog or site and provide us a link in a comment here on this post. We will pick a winner (or two) on the 20th. That gives a few days for you to get the pics to us. It's all for fun and hopefully gave you a jump in creating during this time of year. Gena has done such a great job on these layouts. I love the way she has focused our eyes on the photos in each. They tell a story even without the words. The words provide an additional piece of the story though. Strips of paper are so sharp looking on the page. 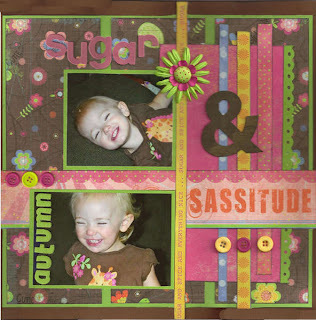 A great way to use just a smidge of favorite papers or perhaps to use up some scraps. Don't you love the layered circle on this layout? Thanks for doing these for us Gena! 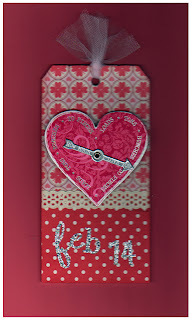 Always an overachiever, Susie did two more tags to take us right through V-day. I'll put info out here tomorrow on how to submit pics of tags for the prizes. Have a good evening. WOW. Who knew it would snow so long? It is really pretty to look at-NOT so pretty to try to drive around in. Hope you all are safe and warm. I'm not sure what dress form Susie used for this tag, but there are several of them out there right now. The newest is the one from Maya Road. 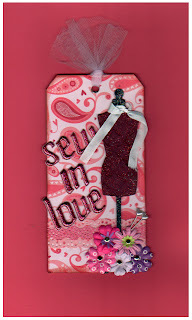 There is a mini collection of hangers and other sewing stuff that would work perfectly on this tag. Ruthe G, your name was picked out of the hat (random number picker). Your prize will be waiting at the store for you. Thanks to all of you who commented. Pockets! I love pockets on everything. Clothes, paper, wall hangings-just everything. This is an adorable pocket. The things you could fill it with! Remember to leave a comment for a chance to win a prize tomorrow. Snow is not the only thing falling around here. 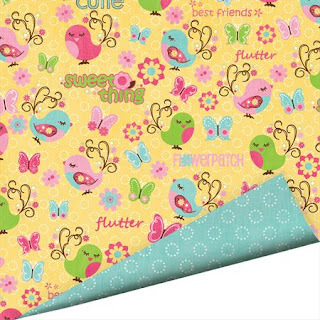 We have more stuff on the 50% off rack and there is cardstock on sale 4 for a dollar. The store is filling up with new product like crazy. Yesterday we received another 10 boxes. Papers and punches. Flowers and stickers. You might want to plan a trip soon to the store to stock up. Another tag loaded with fun. If it seems a tad blurry, it is because it is so dimensional. These were scanned in to the computer for you. 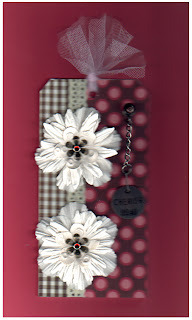 Just look at the buttons, mini flowers, fragments, bling and all the things put onto this tag. Thanks for all the comments. Frank has won the prize for today. Let us know Frank if you aren't coming by the store.....There'll be another prize for Friday from those commenting today and tomorrow. 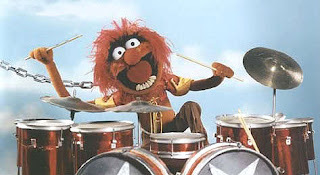 Truthfully though, there is so much wonderful product coming in, it will start to sound redundant. We got 4 lines of Prima papers with matching flowers, stickers and pebbles. In addition, of course, there are other flowers too. So many it is impossible to list them all. Who knows what excitement will be in the boxes delivered today!?! So many fun elements on this tag too. The bingo card, the Ideology grungeboard latches, the little crepe paper pinwheel from Making Memories, etc. That little strip of paper should be easy to find on my table right now. Tomorrow, I will pick a name from those who posted on Sunday's & Monday's posts, but don't let that stop you from leaving your thoughts on this one (smile). Product continues to roll into the store. Jenni Bowlin came in yesterday-all the embellished butterflies, bingo cards, vintage looking buttons, baby boy and baby girl papers and some other papers from the Homespun and Black and Red lines. The new Bazzil has arrived and will be put out today. Little Yellow Bicycle's Generation Z has also come in and is out on the shelves. Sorry for the evening post instead of morning. Will do the prize on Wednesday instead of tomorrow. Post on yesterday or today's post and you might be the winner! Even though the groundhog saw his shadow, we know Spring is coming. Despite the cold days right now, I look forward to the flowers and birds of Spring. I really think that Dee Dee captured the feeling of Spring in this banner. She started with the Maya Road flower album, the Maya Road Canvas banner (brand new this month). She painted the flowers a soft green then sanded the edges. Applied a lot of beautiful layers of flowers, brads, stickers, made little pinwheels of paper, painted and glittered the chipboard alphabet. Strung on lovely ribbons with soft bows, it pulls together perfectly. Clicking on the picture will enlarge it if you want to see it in more detail. 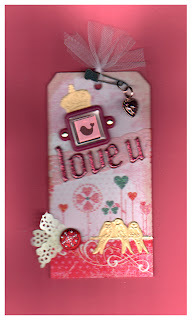 Susie did another fab tag for today. 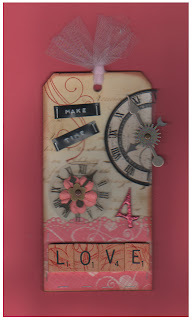 The "Valentine" embellishment is from the Making Memories Love Struck line. 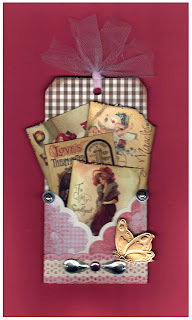 There are so many fun things on this tag; Tim Holtz film strip and clip, Maya Road heart trinket pins plus the tulle and other fun doo dads. The winner of the prize from yesterday is Dee Dee. I am crossing my fingers for more posters today. I will do a prize Tuesday for posting on Today's and Monday's post. We are anticipating a LOT of product next week and will keep you posted as it rolls in. 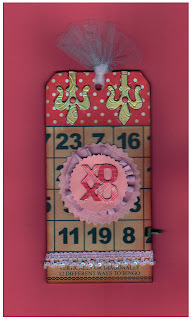 Another yummy tag for you to make. Are you making any of them? all of them? or is this on your agenda for the weekend? Hope this is sparking some creativity in you. I have heard from a few of you on other communication sources (email, FB,etc), but would love to see you post here too. I realized that I forgot to tell you that a new Easter line is in the store too. Many Easter lines don't show up until the end of Feb/first of March, so this is a chance to do some early work for the holiday! The line is Hippity Hoppity from We R Memory Keepers. A cute line with this darling little bunny embellishment. This tag uses that cute heart spinner from Little Yellow Bicycle, but I am quite sure that even without that piece, you can figure out something for this tag. It was great to hear your thoughts on the tag from yesterday and how you saw using it or making it. Based on random number picking, Carmen is the winner of the prize. It will be at the store if you are coming that way soon. If not, email us and we'll get it to you. The products are now starting to roll in. January is always kind of blah without many new products. Thankfully, we were able to get some great things in during that month. Now the new stuff that we saw at CHA is rolling in. A new company we ordered from is Impression Obsession. 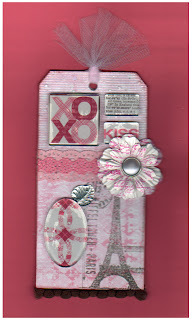 They have some great stamp images including a 6 x 6 stamp that covers a card or would work as background stamps. Their images are really nice. We also got some of their cling stamps and the mega mount. See their product here. Click on their 2009-Fall-Winter-IO-Supplement. It will open up a pdf of all of their products. Be sure to scroll down and see the mega mount. Also, Thursday, we received two paper lines from Three bugs in a Rug. Another new company for us. The first is Animal Stackers. Cute for baby or a trip to the zoo. The full line can be seen here. This line is The Great Outdoors. Camping and many other outdoor activities could be capture on this paper. Two lines from Imaginisce came in as well. One is called Lucy Bird. Here is one of the papers from this line. Sweet. Thankfully, there are some lines with birds in them this season. So many people have asked for them. Their other line is Scooter's Vacation. 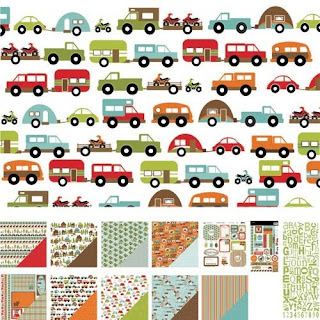 Designed to be versatile, not just for a trip, but can be used for other memory making occasions too. Here is a picture of the pack. We also got a full display of Flower Soft. If you haven't used it, you should. Here are a couple pictures from their booth at CHA. They have a blog as well, and have awesome samples there. Despite the name, it is also perfect for fur, clouds, frosting and other textures you would like to add to your work. In addition to all of the above, we have received two boxes of ribbons...and still have more to go. Leave us your thoughts----on the tag, new product, ideas, etc. 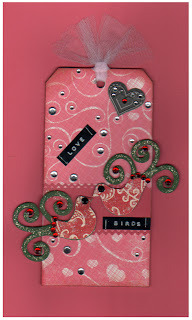 Today's tag uses some Pink Paislee Valentine's paper. (Not a requirement of course) I'm anxious to see what everyone does on this tag. DOn't you love the white ink swirls on the darker background? I will pick a person's name at random for a prize out of comments left on this post. You don't have to be doing the tags to comment. 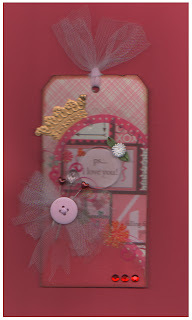 Regarding the grand prize from those who email us their tags at the end of play, we've added a 3 tin set of pink embellishments from Bo Bunny to the Tim Holtz stamp set. Never know what else will get added. What are your thoughts about today's tag? What else can you use for this look? A yearly event is the Ranger Challenge Wall at CHA. This year, the challenge was to use the melting pot with UTEE and the ticket. This is a picture of the wall. WOnderful results and all so different. Although two of the appear to have popcorn on them, it is UTEE, not real food. Suze Weinberg is the genius behind the melting pot art. Check out her blog for close ups and more info. On the store blog, there is a contest/challenge going on. Be sure to take a look and leave comments for a chance to win a prize. Eeny, Meeny, Miney Mo.....The winner is Debbie. Next time you are at the store, pick up the prize chosen especially for you. We will have prizes on some of the daily tags, so let us know your thoughts with comments. You don't have to be doing the tags to comment, but if you are, we like to know as well. After the end of the countdown, we will have you send an email of your completions to us. 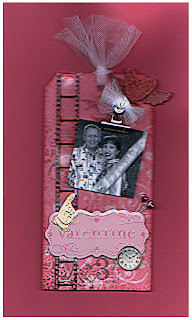 We will pick a winner and that person will receive the new set of Valentine Stamps from Ideology. Now, for the day 3 tag. Are you using up your stash doing these? Perfect way to use up those scraps too. Here is the cute tag for the 2nd day. Again, you don't have to make it exactly like this. In fact, you might decide to turn them into cards. The goal is to get yourself crafting using this as a starting point. 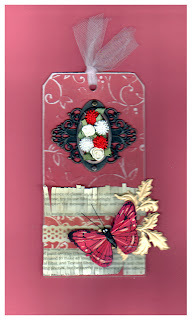 On this tag, she used the fragments to cover sections of paper. Glossy accents, zip dry or other clear glue will work to hold the fragments in place. The fragments make the sections stand out nicely. Be sure to tell us your thoughts and whether or not you are making anything along with us. I will pick a winner from comments on today's post for a prize and announce it tomorrow when I post the day 3 tag.